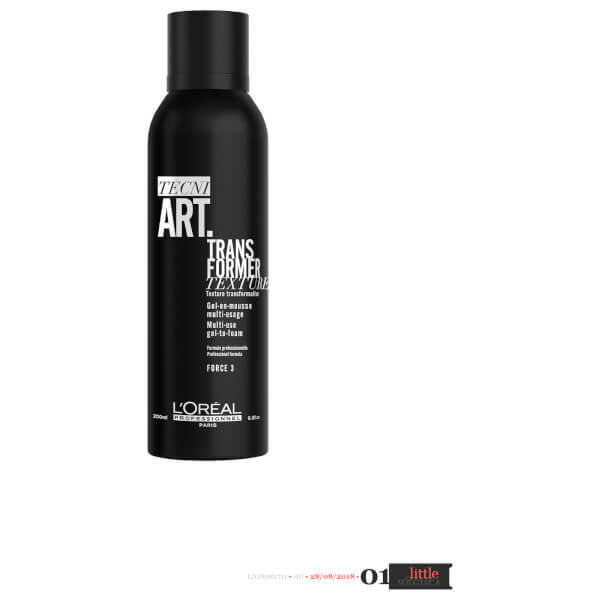 Explore a multitude of professional hair styles from controlled short quiffs and pompadours to bouncy curls with the LOréal Professionnel Tecni.ART Transformer Gel; the first multi-use gel-to-foam styling formula that lends hold, volume, texture, definition and movement to locks. A gel that emulsifies into a lightweight foam, the super versatile formula works on all hair types and allows you to experiment with a range of styles without weighting tresses down or leaving behind stiffness or residue. Apply with fingertips, gently emulsify the gel into a light foam. Apply throughout dry and damp hair, short and long hair. In case of clogging, rinse the nozzle under warm water. Aqua / Water, Butylene Glycol, Pullulan, Cetearyl Alcohol, Polysorbate 20, Behentrimonium Chloride, Phenoxyethanol, Cetyl Esters, Peg-90m, Amodimethicone, Sclerotium Gum, Isopropyl Alcohol, Aloe Barbadensis Leaf Juice, Trideceth-6, Citric Acid, Linalool, Limonene, Benzyl Salicylate, Benzyl Alcohol, Cetrimonium Chloride, Hexyl Cinnamal, Citral, Alpha-Isomethyl Ionone, Hydroxycitronellal, Geraniol, Bht, Potassium Sorbate, Sodium Benzoate, Parfum / Fragrance. C228016/1.